The world premier of the new Fjord 42 Open took center stage at the Monaco Yacht Show this year. 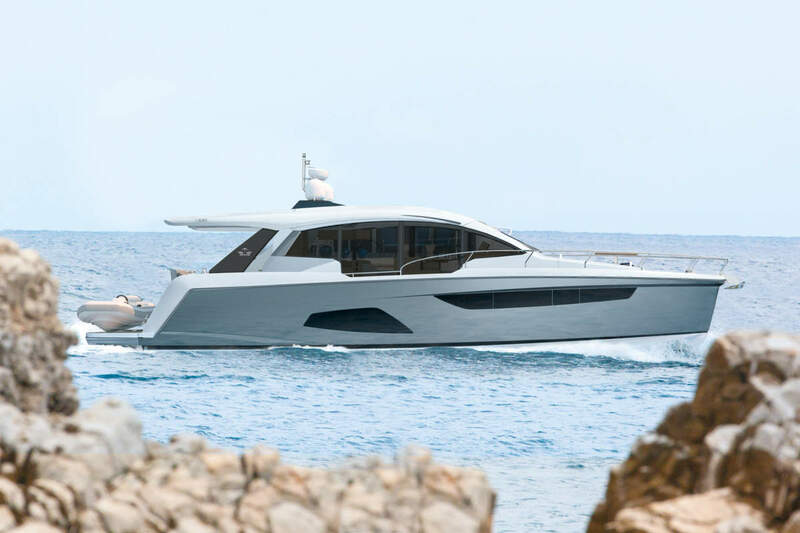 Fjord is known for styling unique powerboats and the 42 open doesn’t disappoint. The vertical bow with a clear visual spectacle of the extraordinary hull stands out in any port and is the master stroke of outstanding designer Patrick Banfield. The WSB team got a chance to take a closer look at this new tasty addition to the Fjord range. The latest development of the brand portfolio of the Hanse Group, the new Fjord 42 open, presents an even more striking hull design and a flat deck layout. The 12.59 meter long and 4.27 meter wide powerboat is both sporty and multifunctional. The large bathing platform can be lowered hydraulically and used for a dinghy or to access the water. The anchor can be raised and hydraulically stowed in the anchor locker on the bow by the push of a button from the dashboard. The new T-Top contains lots of electronics, first and foremost the electrically retractable soft-top bimini, which shadows the rear cockpit area on request. The new Fjord 42 open is powered by two Volvo Penta IPS engines with 370 hp, or optional with 435 hp each. The larger IPS 600 engines accelerate the Fjord to 40 knots and more. The IPS Forward Drive is thereby very efficient and a joystick enables easy maneuvering. The new Fjord 42 open is controlled via an innovative dashboard that can be equipped with two 16 inch Raymarine displays. The touch screen displays can thereby be operated from all three sport seats. The deck layout offers two large sunbathing areas on the bow and on the stern. The cockpit is Fjord typically designed with an outdoor kitchen under the T-Top and seating area, which can be converted into another sundeck. At night, the indirect on deck lights on the ground, behind the hand rails and on the T-Top create a phenomenal atmosphere. Below deck awaits the owner pure Fjord design in the master cabin, with a large island bed, ample shelves and storage space as well as amnesties such as TV and a Fusion sound system. A second cabin with twin beds can accommodate more guests on board. Fjord deliver a unique balance of space and comfort on the 42 Open, easily considered as a high end tender or as the name suggests an “open” summer day cruiser. Either way the 42 combines a simplistic approach to classic lines, delivering style in the “boat loads” excuse the pun!